“The Collection” short story book marks my introduction to the dark mind of Bentley Little. I have only read a couple of the stories and so far, I am enjoying them. The first one on the list is “The Woods Be Dark”, a tale that starts out like some sort of zombie or possession tale and goes to a disturbing place as a girl must be the saviour for her family and suffer a horrific violation. The story begins with the main character, whose name is not given, seeing her brother returning home late from a fishing trip. It is after dark and this causes alarm as he tries to approach the house. Momma stops him from getting close, shooting him in the head. The next night, he returns, whole again, still trying to get to the house. The next day it is determined that the girl will have to go to the bad place and go through the ritual. There isn’t a name given to what the brother or father before him have become, and what happens during the ritual is not described in detail. What I liked about the story is that there is no name given to the monsters and the violation is implied, shown through Little’s words rather than vividly explained. We all have active imaginations and can figure out what is happening without being subjected to the gory details. Don’t get me wrong, I’m not squeamish (like a comic book guy seemed to think yesterday) but I appreciate the subtly of what Little is showing us happens to the girl. He portrays the girl as strong in the face of the terror and angry she feels at having to be put through the dark woods and the consequences of that trip to the bad place and the ritual, again. I say girl but I think is supposed to be in her teens, not a young girl. All and all, this is a good story, condensed and well told. 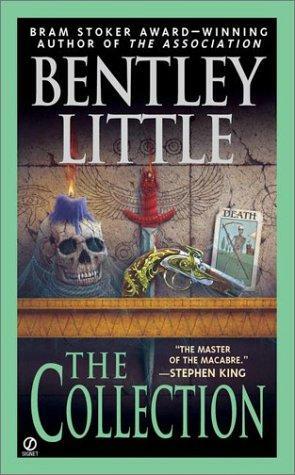 I will continue with “The Collection” and would appreciate any recommendations on what full length books by Bentley Little are worth reading. Have a happy Sunday! This entry was posted on February 9, 2014 by Denise in Book Reviews, Reviews, Scary Shorts and tagged Bentley Little, scary shorts, Short story, The Collection.